One of the storage industry’s pioneers and long-time leaders, Western Digital has announced the launch of its new Scorpio Black 7200 RPM 2.5-inch SATA notebook HDDs, shipping in capacities from 80GB to 320GB, aiming to deliver the capacity and speed needed to supercharge a notebook PC without compromising battery life or quiet acoustics. Desktop-class performance for notebook computers – With 7200 RPM spin speed, SATA 3 Gb/s, 16 MB cache and capacities up to 320 GB, these drives enable you to have the best of both worlds: the capacity and performance of a desktop PC with the convenience and portability of a notebook. IntelliSeek – IntelliSeek technology calculates optimum seek speeds to lower power consumption, noise and vibration. SecurePark – WD’s SecurePark technology parks the recording heads off the disk surface during spin up, spin down and when the drive is off. This ensures the recording head never touches the disk surface resulting in improved long term reliability due to less head wear, and improved shock tolerance. ShockGuard – WD’s ShockGuard technology protects the drive mechanics and platter surfaces from shocks during shipping and handling and in daily operation. Free-fall Sensor – As an added layer of protection, if the drive (or the system it’s in) is dropped while in use, WD’s free-fall sensor detects that the drive is falling and, in less than 200 milliseconds, parks the head off the disks to help prevent damage and data loss. 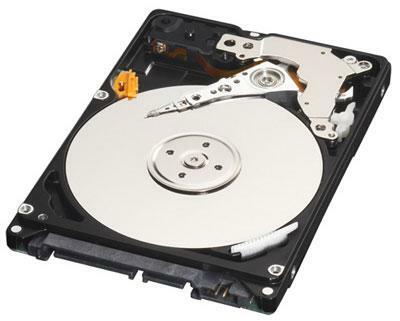 WhisperDrive – WD’s exclusive WhisperDrive technology combines state-of-the-art seeking algorithms that result in one of the quietest 2.5-inch drives on the market. The new Western Digital Scorpio Black hard drives are now available at select distributors and resellers, with a MSRP of $249 for the 320GB model.